Daylight stretches longer, lawns are beginning to turn green and buds are appearing on the trees. Spring is on our doorstep on Wright’s Mesa, which brings Eastertime and its emphasis on eggs. From a Christian perspective, Easter eggs are said to represent Jesus’ emergence from the tomb and resurrection. But humans of all stripes have long celebrated eggs — an ancient symbol of life — in conjunction with spring. Eggs have been associated with pagan festivals celebrating the equinox and other springtime traditions for thousands of years. These days, we paint them, hide them and hunt them each spring. And, of course, we eat them. Which is a good thing, because when it comes to nutritional bang for your buck, eggs are hard to beat. Along with milk, eggs contain the highest biological value for protein. One egg contains only about 75 calories but 7 grams of high-quality protein, 5 grams of fat and 1.6 grams of saturated fat, along with vitamins, iron, minerals and carotenoids that contribute to brain function, muscle strength and eye health. But not all eggs are created equal. 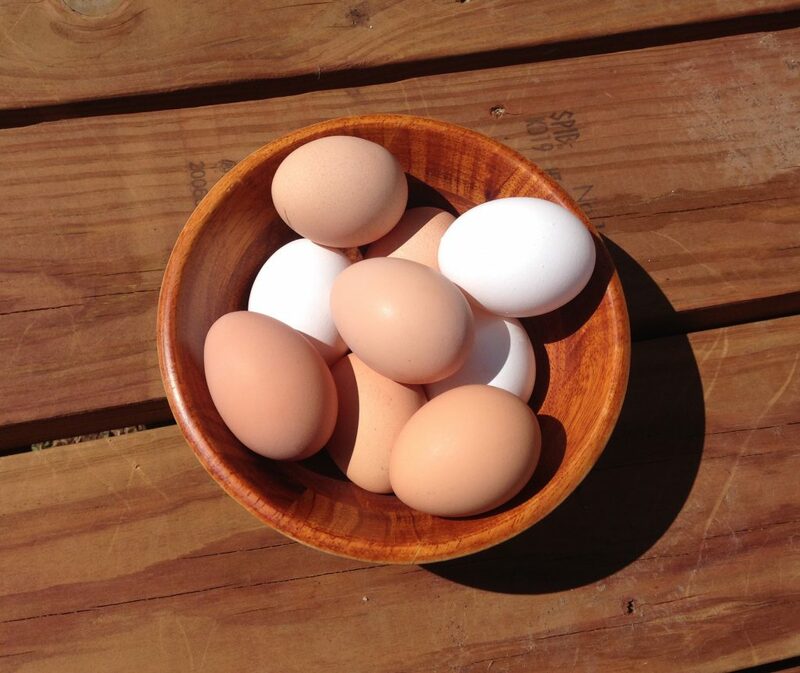 The nutritional value of an egg depends on what the chicken that laid said egg consumes. Some chickens dine on feed that consists of little more than cereal grains. Others eat feed enriched with healthy ingredients such as kelp, flaxseed or fish oil. And if hens are allowed to roam through backyards or farm fields, the omnivorous and ravenous creatures will get their beaks on an even bigger variety of food, such as insects, grasses and kitchen scraps, which add value to the quality of the eggs (this can be detected in the darker shades of orange in the yolks and deeper flavor). For this reason and others, many people keep their own chickens. My husband and I have three hens ourselves; silly and simpleminded birds, ever hungry and always entertaining. After they took a break from laying to molt in the fall, they’ve come back in a big way, and are currently laying more than a dozen eggs a week for us. This keeps us eating a lot of eggs, and also forces us to get creative. Luckily, eggs are endlessly versatile. Of course, we all know that eggs make the ultimate breakfast centerpiece, fried, poached or scrambled with toast, bacon or sautéed greens. But they go way beyond that. Hard-boiled and mixed into salads or sandwiches, eggs add a tasty source of protein to lunches. A fried or poached egg can be laid atop a variety of dishes, from pizza to ramen and vegetable hashes, for an easy meat-free dinner. Eggs bring authenticity and richness to dishes like fried rice, pasta carbonara and Caesar salads. They are used as the foundation for fritattas, quiches or breakfast casseroles. And, lest we forget, eggs are also essential ingredients in desserts that range from cookies to cakes and soufflés. And that barely scratches the surface of this perfect self-contained package of food. We keep a batch of hard-boiled eggs in the fridge at all times for snacks or salads, (boiling at full roil for 9 minutes before plunging them into ice water yields a just-right gummy yolk), while our raw eggs come in handy for breakfast and dinners. Here is my favorite easy egg dinner. Bring 2 cups stock to boil (reserving remaining half-cup). Add polenta, stir and turn down heat to a simmer. Simmer, stirring often, until polenta is thickened and soft, 10-15 minutes. Season with salt and pepper. Heat oil in sauté pan and add kale, stirring until it wilts and turns dark green. Add remaining stock a little at a time, letting the liquid cook off. Remove from heat. Fry eggs in oil over medium-high heat in sauté pan, flipping once to ensure the whites are cooked but the yolks remain runny. Spoon polenta onto plates. Top with kale and eggs. Season to taste.